The new float, “Warrior Strong,” is 102 feet long and two stories high (22 feet) — the tallest the Parade Company has ever built — and features a gigantic three-tier cake large enough to feed 150,000 people. 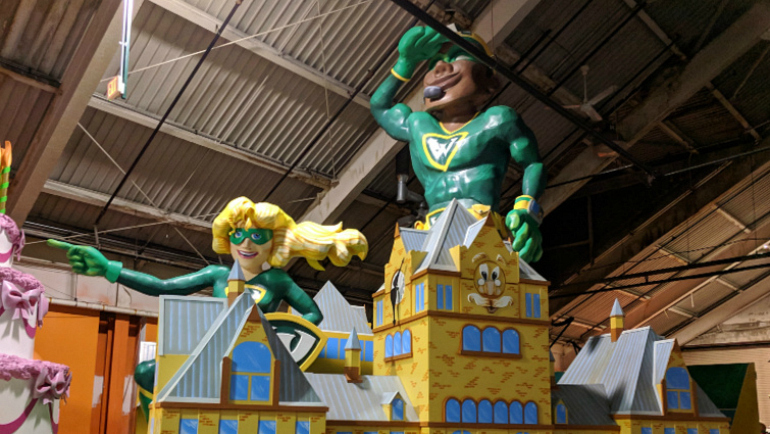 Wayne State University unveiled its new float, “Warrior Strong,” this morning during the 19th Annual Parade Pancake Breakfast presented by Blue Cross Blue Shield of Michigan (BCBSM). In celebration of the university’s 150th anniversary, the “Warrior Strong” float will make its debut at the 92nd America’s Thanksgiving Parade presented by Art Van with a national broadcast reaching 185 major cities across the country. Dan Loepp, chairman of the Michigan Thanksgiving Parade Foundation and president and CEO of BCBSM, and Tony Michaels, president and CEO of The Parade Company, were joined by celebrity pancake flippers and hundreds of business and community leaders to serve up flapjacks to more than 1,000 guests. The new float, “Warrior Strong,” is 102 feet long and two stories high (22 feet) — the tallest the Parade Company has ever built — and features a gigantic three-tier cake large enough to feed 150,000 people. The vibrant float also features larger-than-life superheroes carrying giant Warrior shields. Helping Wayne State University celebrate 150 years on Thanksgiving morning are Cedric Mutebi, representing the Wayne Med-Direct program; Honors College student Kavya Davuluri; Dazmonique Carr from the College of Education; and Michael Rachwal from the Mike Ilitch School of Business. They represent the more than 27,000 students from around the world who attend Wayne State University, which just welcomed the largest freshman class in its history. 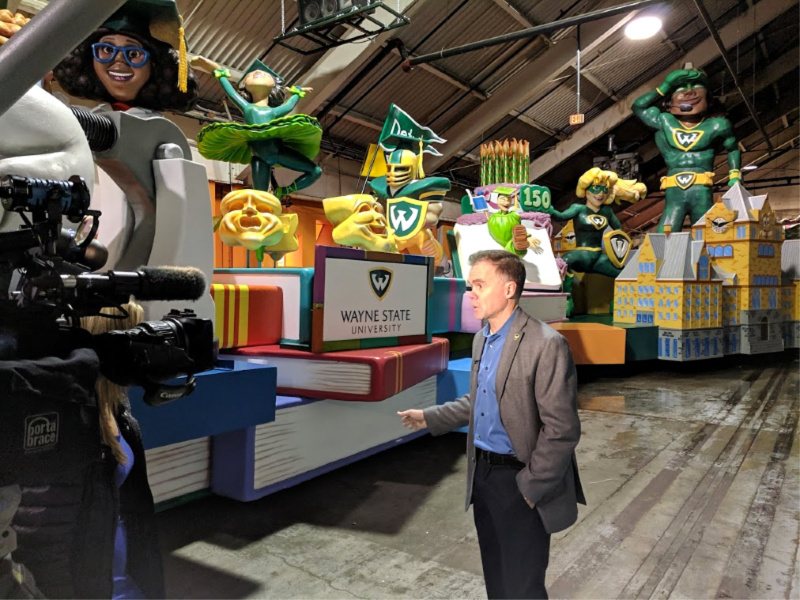 Michael Wright, vice president for marketing and communications and chief of staff for WSU, discusses the float with reporter Kim Degiulio at the unveiling during the 19th Annual Parade Pancake Breakfast. Recognized as one of the Best Holiday Parades in the USA Today 10Best Reader’s Choice travel award contest and one of the best Thanksgiving parades in the country by U.S. News & World Report Travel, America’s Thanksgiving Parade® presented by Art Van will be featured on WDIV-Local 4, including a one-hour national broadcast reaching 185 major cities across the country. News/Talk 760 WJR’s Paul W. Smith and Entercom will also broadcast live from the parade route. 104.3 WOMC’s Stephen Clark and JoAnne Purtan (Mornings WOMC) will host the live broadcast. For more information, visit theparade.org. Wayne State University opened its doors in Detroit in 1868, and is home to 13 schools and colleges, with top-ranked programs in medicine, business, nursing, law, the arts and more. One of the nation’s 50 largest public universities, Wayne State University is known for its groundbreaking research and commitment to community service. Founded in 1984, The Parade Company is a not-for-profit organization governed by the Michigan Thanksgiving Parade Foundation whose board of directors is comprised of key civic and corporate leaders in the greater Detroit region. The Parade Company is celebrating more than 90 years of Parade tradition in Detroit and is committed to funding, creating and executing the best family events in Michigan. The Parade Company staff, board of directors and thousands of parade volunteers work year-round to bring a wide variety of magnificent events to the City of Detroit and the region including the Ford Fireworks, Strategic Staffing Solutions Turkey Trot, and America's Thanksgiving Parade® presented by Art Van. Follow The Parade Company on Facebook, Twitter and Instagram.